~ by Jamie Boudreau on October 23, 2010. Sound really nice. Lets hope this doesn’t show up in the Maker’s Mark competition tomorrow here in Holland. And I really loved the cherries filled with an Old Fashioned mixed that you posted long ago! Love your shoe analogy. I’m on a bit of a kick to try to help bridge the cocktail divide and that’s definitely going to come in handy. I hope you don’t mind me borrowing it? As for the cubed old-fashioned. My lord! That’s challenging and kind of meta as well. Raises an interesting question of whether cocktails can be high art rather than craft. Can the excite the intellect as well as the taste buds? I sense some research will be required. I like the thinking that went into this, and the playful exploration of ingredients. I’m curious, though, about what point a variation becomes a wholly new drink. Is this still an old fashioned when you’re upending every part of the traditional recipe? It’s an interesting question to me. As fall is underway, and pumpkin ales are back on the market, I’ve found that an Old Fashioned made with Rittenhouse 100 and your Pumpkin Ale Syrup is quite tasty, and season-appropriate! Just lovely, Jamie. I couldn’t even conceptualize it before I tried it. The flavors jostle on your tongue then slip away into pleasant orange and syrup. I used your recipe except instead of your special syrup I used the usual syrup with a drop of sambuca and muddled orange zest. Thanks for sharing. Really glad to see you’re posting again! You were the first I followed and my most revered as far as blogs are concerned. Please keep up the much appreciated work for all of our sakes. Seeing as the old fashioned only exists because folks who couldn’t “let things be” insisted on calling things cocktail that didn’t meet the definition of cocktail, it’s particularly grating that the old fashioned is having its name co-opted nightly. I wonder when we’ll need a new name for spirit-sugar-bitters-water…too soon, I imagine. Kyle makes an interesting point. Wouldn’t you have to give your version of the Old Fashioned a new name since it hardly contains any of the same ingredients? I think its probably an excellent drink – why not take credit and give it a new name? I don’t see this as “upending” or really deviating from the Old Fashioned recipe at all. In fact, as far as things go, I’ve really changed little. The Old Fashioned historically was made with whatever spirit one could find, and more often than not, that was rum, rye and if you were lucky, Cognac.All I’ve done is use all three, which makes for a complex spirit. If you were to taste the mixture straight, you’r probably guess it was a single spirit and not a blend (which, by the way is how most whiskeys and pretty much all cognacs and rums are made). As for using three bitters, bitters themselves are complex flavours, and I assure you that Angostura was not the go to bitters in the original old fashioned cocktail. If I were to make a homemade bitters that incorporated all the flavours of the three mentioned, would that be ok for you? The reason that I chose the brands of bitters listed was their proximity to the now defunct Boker’s bitters that you can no longer get. Anywhere. Finally, the sugar. Sure I’ve used a flavoured sugar, my only true deviation, but it is flavoured with ingredients already in the cocktail, so I truly don’t see the harm. Gentlemen, I urge you to make the Cubed Old Fashioned and then decide if it doesn’t exactly resemble an Old Fashioned, only with much more complex nuances and flavour notes. Quick question regarding the “Old Fashioned Syrup”: your last step instructs us to add 1.00 oz of bourbon/rye to preserve the syrup (presumably after it has been funneled into a sanitized container) — are we supposed to shake the syrup so that the bourbon/rye is incorporated into mixture, or do we just let it float on top when we seal the container? Thanks for sharing your innovative thoughts and experiences with us regarding this classic cocktail! The addition of the rye is only if you plan to have the syrup around for months and do not plan to refrigerate it. If that is the case, yes, add the rye and shake or stir to incorporate. This syrup will last for months and months if kept in the fridge though. Nice post and nice photo, when I will have time I will try the Cubed Old Fashion. Im with you 100% on the old fashioned, though I remember going through a faze of loathing having to make them. With regards to syrup I used to incorporate velvet falernum into any of the lime based ones with a lot of success. 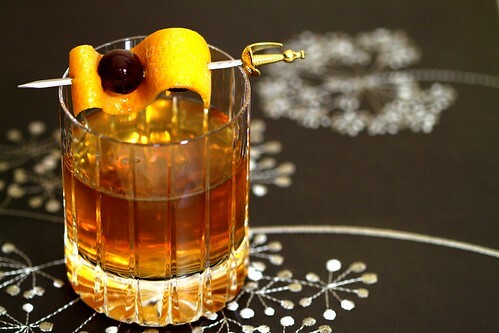 Any ideas for a christmas old fashioned, Im thinking of flaming a mixture of dried spices in cherry bandy in the tumbler prior to assembly, any thoughts? My passion now is whiskey so anything related to this is greatly appreciated. If you try the Cubed Old Fashioned it is VERY christmassy, what with all of the Xmas spices in it. As for your Cherry brandy idea, the only way to know for sure is to try it! Sounds like it might work though I’d be concerned about serving this drink in a warm glass. The Sazerac is my drink o’ choice, it’s one more taste aspect past the Old Fashioned, with the absinthe. A well-balanced Sazerac is a great thing. Loved this blog, especially some of the examples of the experimentations you’ve done with it. I will be trying out a few of these in coming days I think. Good stuff Maynerd. I like me some of the Old Fashioned style drinks myself. I have to check this out sometime and mix some up. I prefere using good quality mapple syrup than the old fashioned syrup and good gentle dashes of scrappy choco. Stunning recipe. Favorite for the moment and for a while. Bravo ! Jamie, I always love your style and information – you’ve added a LOT to my home-cocktail enthusiasm. My Old Fashioned recipe is fairly standard but I also go the route of replacing granulated sugar with some kind of syrup to cut down on time and risk of grittiness at the bottom of the glass. Lately, I’ve been grooving on my own Rich Brown Sugar Syrup (2:1), 3 dashes of Angostura and 2 dashes of either Reagan’s or Angostura Orange Bitters. If I have a stronger sweet tooth I’ll go with Fee’s Orange (less complex, more orange-sweet). Maker’s is great for that sweet tooth, too, or if I want a more complex, dark and smokey variant – Knob Creek, Dickel, or 46. This is nice one. I like it and also bookmark this article. Anybody can hire cocktail bartender from our company. Thanks for sharing great article, I like and love it and also bookmark this article. Thanks again. Your blog is true and awesome.Thanks for sharing this blog . Thanks a lot .It is important and useful post. I love the drink as old Rum lover. I can’t wait sharing this great drink with my friends also..